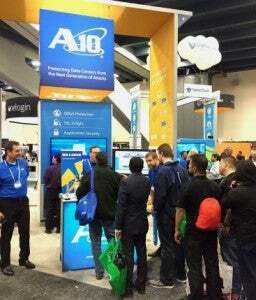 A10 Networks just capped an exciting week at RSA Conference 2015. If you didn’t attend, make sure you mark your calendars for next year. Between the packed sessions and the buzzing tradeshow floor, RSA delivered everything that a security tradeshow should: informative keynotes, engaging panel discussions, and two exhibit halls chock full of established cybersecurity leaders and emerging startups. Many attendees watched live DDoS attack demonstrations at our DDoS security pavilion. We also showcased the integration between A10 Thunder ADC and RSA Security Analytics, revealing how A10’s SSL Insight technology can decrypt SSL traffic and forward network traffic in clear text to RSA Security Analytics for analysis. This demonstration coincided with our announcement on Monday, April 20th, that we’ve validated interoperability with RSA Security Analytics. RSA Conference 2015 was a huge success for A10! We hope to see you at Microsoft Ignite (booth #332) in Chicago next week or at Black Hat USA (booth #1135) in Las Vegas.